One of the most polarizing figures from the 2008 financial crisis is joining the Federal Reserve. Neel Kashkari, who oversaw the U.S. government's $700 billion bailout of big banks, was named president of the Minneapolis Federal Reserve on Tuesday. Kashkari followed Hank Paulson from Goldman Sachs (GS) to the Treasury Department, where Kashkari would eventually become the brainchild behind the deeply unpopular bailout known as the Troubled Asset Relief Program, or TARP. Kashkari, 42, was strongly criticized during the financial crisis as the face of TARP. His ties to Wall Street didn't help either. Shortly after TARP was implemented, Kashkari left the government to work for asset-manager PIMCO. Unexpectedly, he left PIMCO in 2013 to run for governor of California as a Republican. During his the campaign, he spent a week living as a homeless person in an effort to debunk Democratic Governor Jerry Brown's claim that there was a "California Comeback" for the state's economy. Kashkari admits in a video that while he was living as a homeless person he went to a shelter to ask for food after being unable to find a job. He lost that election. But now Kashkari has a job with the Federal Reserve, working on the committee that has enormous power over global financial markets. 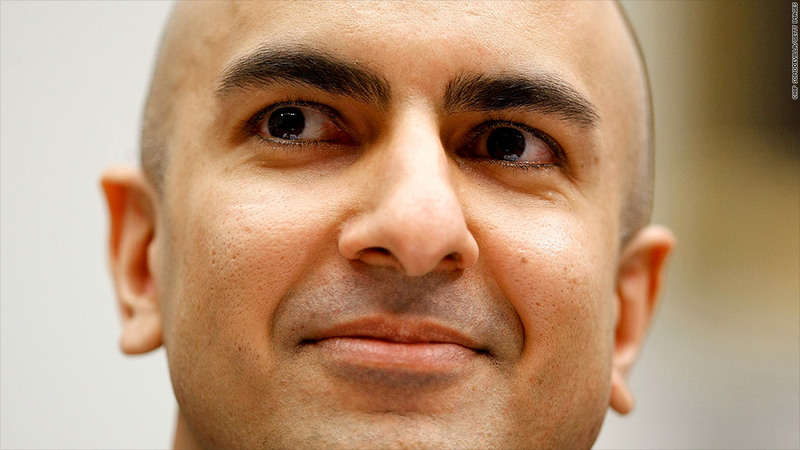 Kashkari was selected by the board of the Minneapolis Fed. Unlike many other Fed committee members, Kashkari isn't an economist. Yet like several other high-ranking Fed officials, Kashkari is a former Goldman Sachs employee. In fact, all three regional Fed presidents named this year used to work at Goldman. The same is true of William Dudley, the New York Fed president who joined the central bank in 2007. Kashkari comes to the Fed as Republican presidential candidates Ted Cruz and Rand Paul have lambasted the Fed for having a revolving door between the central bank and Wall Street. Kashkari begins his term in 2016 so he will not have a vote at the Fed's next meeting in December when it decides whether it will raise its key interest rate for the first time in almost a decade. The Minneapolis Fed declined to allow Kashkari to speak to CNNMoney about his views on monetary policy.